The settlement of Sydney began its life as a penal colony, with a total of 568 male and 191 female prisoner convicts with 13 children, 206 marines with 26 wives and 13 children, and 20 officials having made the voyage. Their earliest huts were composed of cabbage-tree palm, while the convicts were housed in huts made of boards wattled with slender twigs and plastered with clay. By 1790, however, there were 40 convicts employed making bricks and tiles, 50 brickie labourers, and 4 stonemasons. The total convict population that year was 730 persons, with 413 under medical treatment. In fact free settlers did not begin arriving until 1793. See The Rocks, for more history on these early colonial days. There was a shortage of coinage in NSW, so rum, an easily produced spirit from sugar cane, began to be used as currency. Needless to say, this was to slow the settlement’s development considerably, as it is all too easy to for soldiers and convicts to drink their pay compared to trading it for food, clothes and supplies. The colony, not making money, could not pay its bills nor buy the many things it needed from elsewhere. The soldiers of the NSW corps, whose officers had the monopoly on this endless supply of rum, dominated the early governers of the colony. Originally formed to protect the fledling colony from perceived threats of other European powers, they also served as police. When the hapless Governor William Bligh - recently returned from his mutiny on the Bounty - tried to stem this corruption of the NSW Corps, he was imprisoned by them in the infamous Rum Rebellion. However, the Rum Corps were to find out, like the Bounty’s crew, Bligh was not a man to be trifled with. Forced once again to sail all the way to Indonesia as he had after the mutiny on the Bounty, he ensured the British authorities in England would be fully informed of the situation. With the arrival of Governor Lachlan Macquarie in 1810 (along with the 87th Regiment!) the NSW Rum Corps were sent packing back to England. The colony, with the population of being about 10,000, metamorphosed. Much of what you see in Sydney today is a result of Macquarie’s leadership and vision. The coins that the original settlers did have, were the George III twopence, called the Cartwheel penny because of its size. In 1812, in order to relieve the problems caused by the lack of coins, Governor Macquarie bought Spanish dollars from India. He then had holes cut in them to discourage exportation. These well known Australian coins were called the Holey Dollar (even then they had a sense of humour) for the larger part of the coin, while the piece cut from the middle was called the Dump. Declared legal tender Sept. 30th, 1813, the Dump was worth about 15 pence, while the Holey Dollar was valued at 5 shillings sterling. With the crossing of the Blue Mountains in 1813 and the subsequent discovery of the prosperous hinterland, the way was finally clear for the growth and development of modern Sydney. Transportation of convicts to New South Wales (NSW) was finally abolished in 1840 and shortly afterwards, in 1842, Sydney was declared a city. The population grew rapidly during this period, helped by the discovery of gold and the gold rush of 1850 - one year after the Californian gold rush of 1849. Australia received many American and Chinese immigrants at the same time. In 1901 the six British colonies in Australia formed a federation to become the Commonwealth of Australia. This marks the period of the modern country. 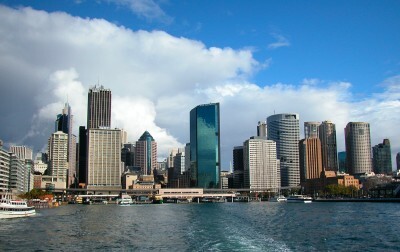 Sydney continued to grow and by 1925 became a metropolis of 1 million people. This grew to 2 million by 1963. Today Sydney has diverse demographics with people from over one hundred countries contributing to its population of over 4 million. The Rocks, Australia’s First Place. About Sydney Places to Visit Sydney Places. 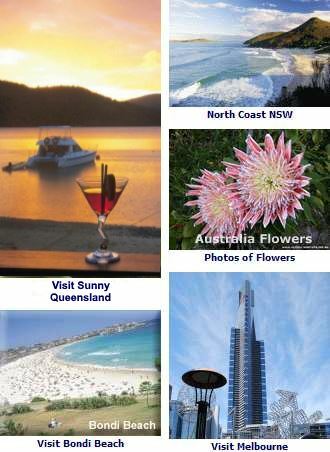 For Sydney beachside hotels, motels and other accommodation Sydney City and Beach Hotels.